I love fancy food and fine wine. I enjoy hanging out with friends, talking and laughing over snacks and drinks. One of my favorite activities is to relax in my big comfy chair and read. I hate cooking so I eat out often. All of this means that it was tough to get to a point where I am exercising regularly and eating healthy (for the most part). I'm actually scheduling this review to publish while I'm heading to run a 5K! 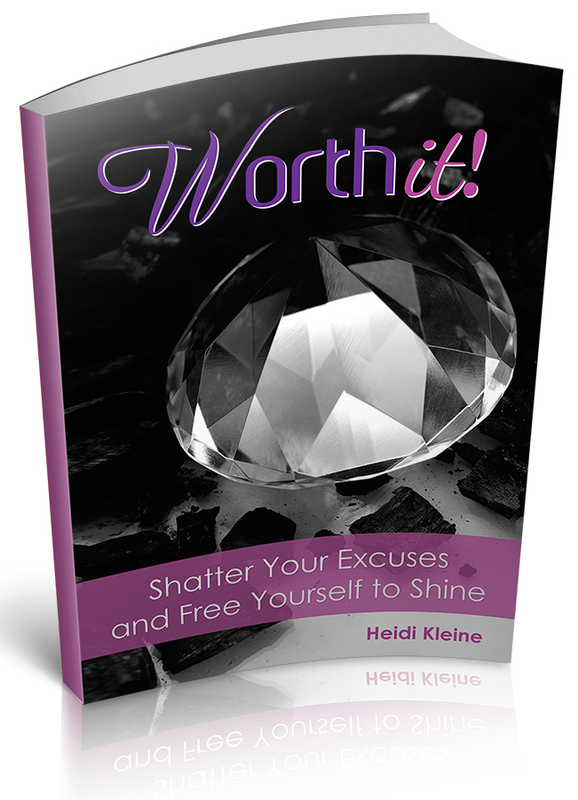 Many of the excuses I used over the years are highlighted in a new book by Heidi Kleine called Worth It! : Shatter Your Excuses and Free Yourself to Shine . As full disclosure, Heidi is my neighbor and friend. She's one of the founding members of our neighborhood book club, which I've been attending for many years. Living in such a close community, I was witness to Heidi's amazing transformation a few years ago, and am thrilled that she has written this new book to help others find their way to a similar path. Worth It! is an easy-to-read but highly emotional book. Heidi is honest about the struggles she has faced with her weight for her entire life, and how difficult it was for her to finally take on that challenge and overcome it. Each chapter presents an excuse that Heidi used to avoid making a change in her life. Through personal stories, Heidi shows how it is possible to move past those excuses. At the end of each chapter, there are three to four Action Steps that help guide the reader on their journey. Heidi offers a free companion workbook on her website that readers can use to answer these questions, reflect on the things that are impeding their progress and realize ways to overcome them. I don't read a lot of "self-help" types of books but I was glad that Heidi asked me to read Worth It! Her story is truly inspiring and she gave me a lot to think about as far as putting myself first and not always trying to prove myself to others. If you're the type who tends to put others first and always comes up with excuses about why you can't take care of yourself, I highly recommend you read this book. It may change your life! Worth It! Shatter Your Excuses and Free Yourself to Shine is FREE on Amazon now through Monday, May 4th. Go download it now! This review was written based on a copy of Worth It! Shatter Your Excuses and Free Yourself to Shine that I received from the author in exchange for an honest review. This post includes Amazon affiliate links. If you purchase the book using my links, I will receive a very small commission from Amazon but you don't pay anything extra. This was such a helpful book. Thanks for inviting me to read it. I am awful. I saw your message and I disappeared. I need to reconnect with you on this! I am glad it was a positive reading experience.